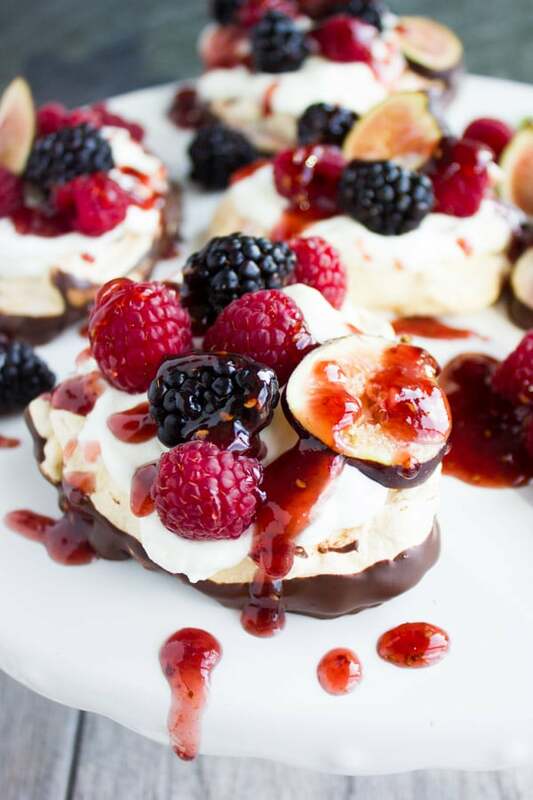 This Chocolate Dipped Mini Pavlova recipe is a light dessert perfect for Valentine’s Day! A heart-shaped, crispy meringue, swirled with raspberry jam, dipped in melted chocolate and topped with vanilla whipped cream, fresh berries, and berry sauce! Looking for a Valentine’s Day Dessert? 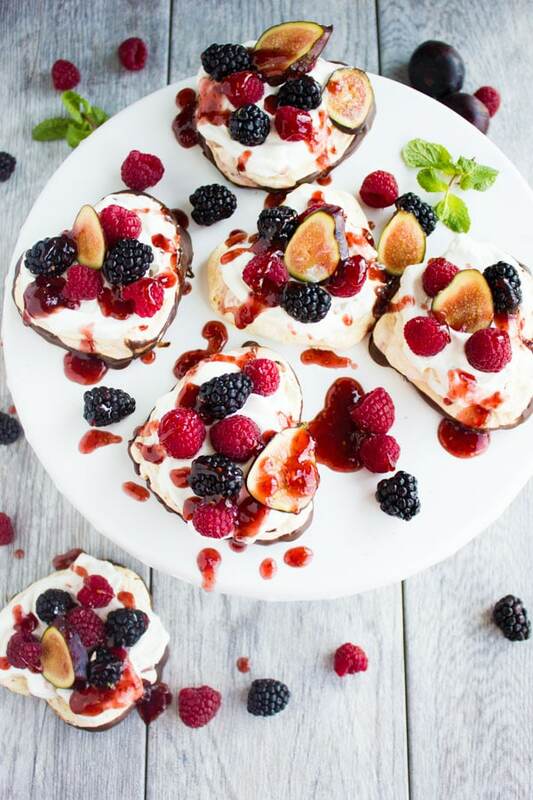 Look no further than these Chocolate Dipped Mini Pavlovas with Vanilla Whipped Cream and Raspberry Sauce! This Chocolate Dipped Mini Pavlova dessert is on the light side, regardless of the added chocolate and vanilla whipped cream because the base is a light and crispy pavlova. The Mini Pavlovas are baked till delicately crunchy on the outside and pillowy soft on the inside. I love dipping the Mini Pavlovas halfway into melted chocolate! It actually makes the Mini Pavlova taste SO MUCH better! A simple vanilla whipped cream goes on top and then some fresh berries. To sauce things up, I drizzle the 2 minute raspberry sauce I used in these mini raspberry cheesecakes. To get perfect stiff meringue, wipe your bowl and beaters with a damp cloth soaked in vinegar. 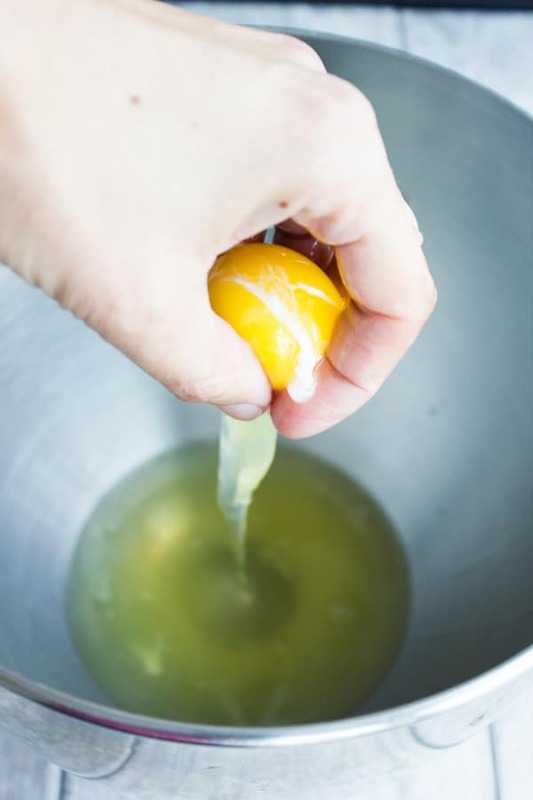 Start with separating the eggs: The best way to separate egg whites is by hand. Simply crack the egg into your hand closing your fingers tight. Then carefully separate your fingers to let the egg whites fall into a clean bowl, flipping your hands to hold on to your egg yolks. If you’re not comfortable trying this, go ahead and separate the egg your way. But I promise this hand technique has no risk of egg yolk leaking into your egg whites. 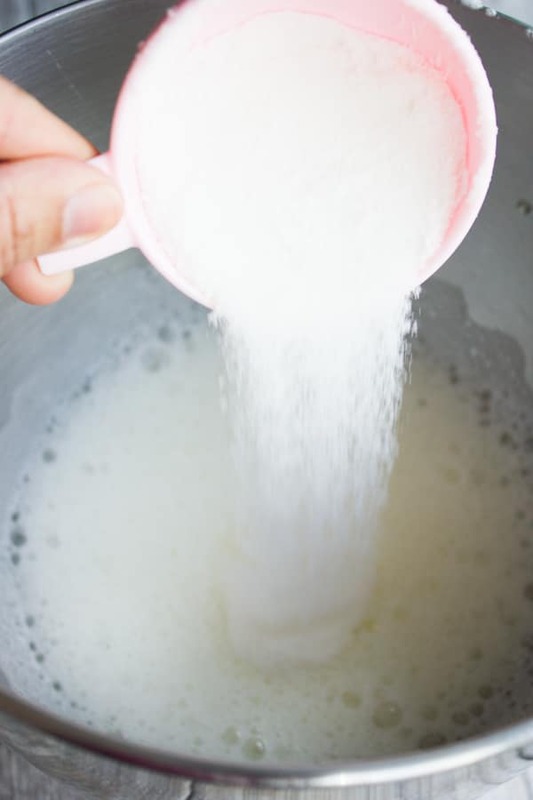 Start whipping the egg whites and when it starts to get foamy, that’s when you add in a pinch of salt and the sugar gradually while whipping continuously. 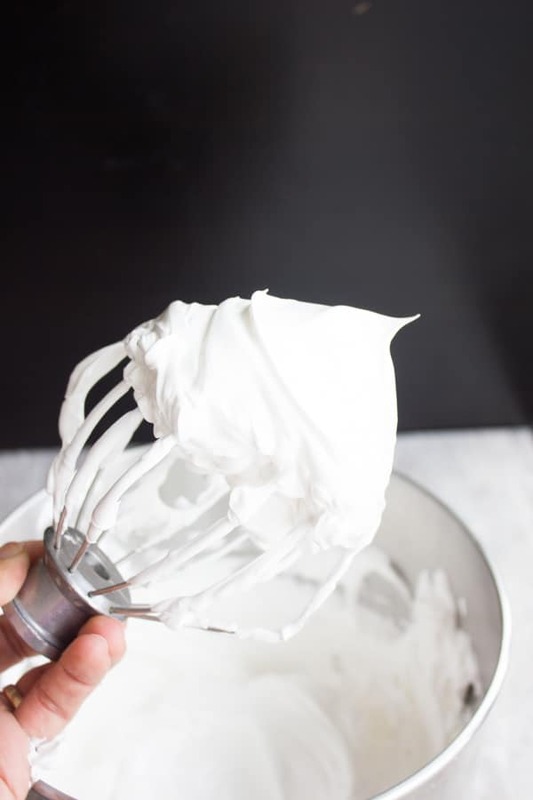 When you reach stiff peaks on your egg whites, take a piping bag and place your hand in it— inside out. 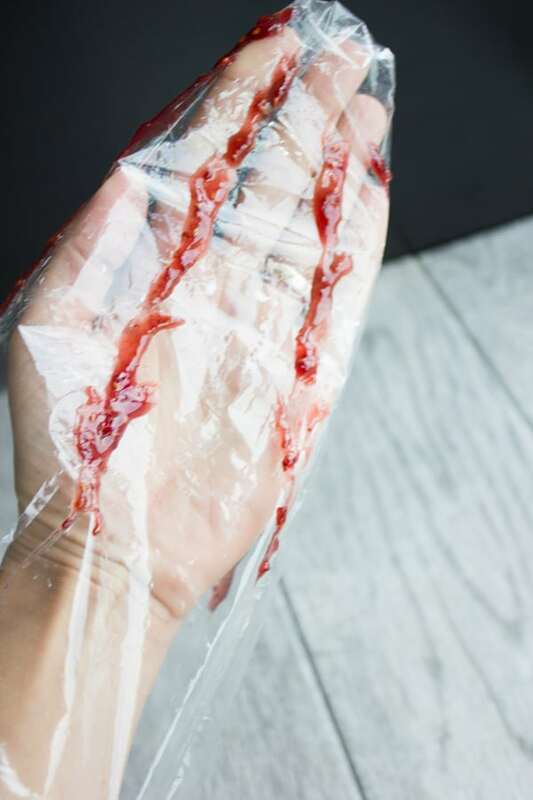 Take some raspberry jam and use a skewer to draw straight lines on the inside of the piping bag, then remove your hands and flip the piping bag back to its original form. 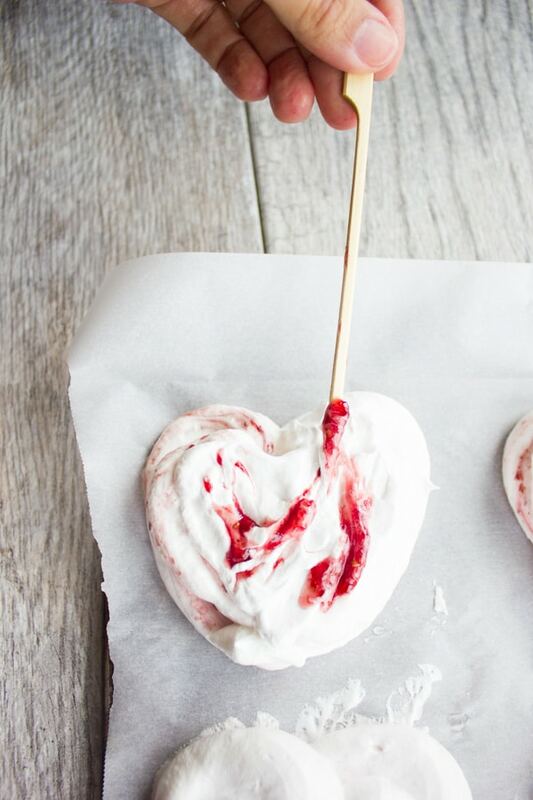 Fill the piping bag up with the whipped egg whites and pipe hearts. You can swirl some more jam on top of your mini pavlovas. Bake these Mini Pavlovas at 230 degrees F for about an hour and 40 mins. When they cool down for about an hour, you can handle them without worrying that they break. Dip half of the Mini Pavlovas in the melted chocolate and allow them to cool for an hour. 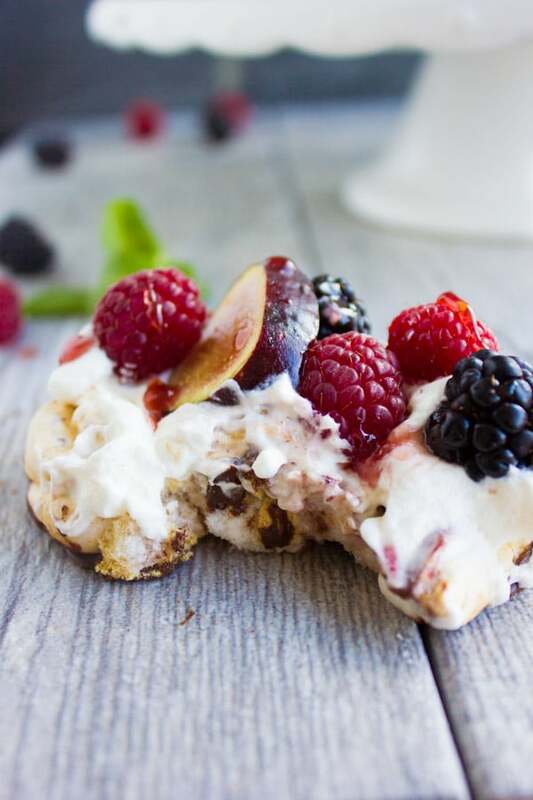 Top the pavlovas with vanilla whipped cream, fresh berries and drizzle them with raspberry sauce. 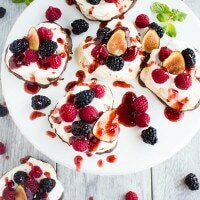 If you want a really light, low cal version of this Chocolate Dipped Mini Pavlova, use vanilla Greek yogurt instead of the vanilla whipped cream, or even coconut whipped cream. 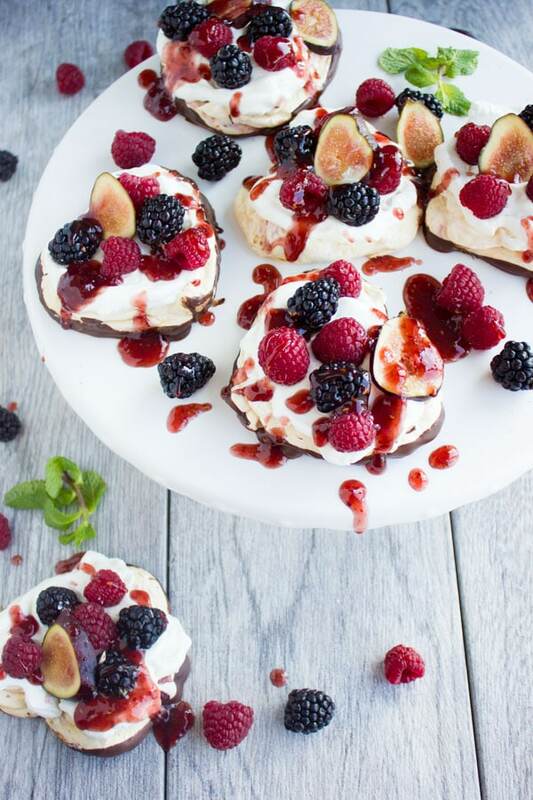 You can skip the chocolate dip and instead decorate your Mini Pavlova with some chocolate chips on top. Depending on the fruit you use, you can also swap the jam for dulce de leche. Planning Valentine’s Day dinner? Make this grilled steak with rosemary lemon butter and serve with these mashed potato rosemary crisps. Want more meringue-based dessert recipes? Try these espresso amaretti cookies. 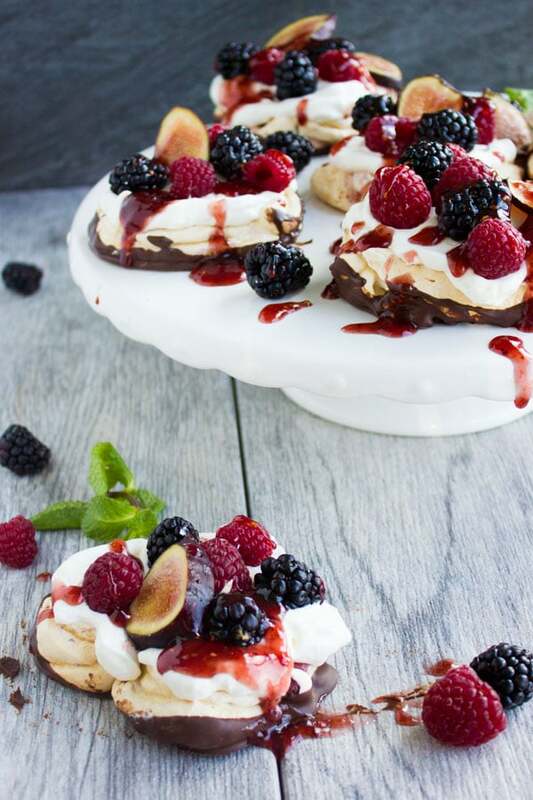 This Chocolate Dipped Mini Pavlova recipe is a light dessert perfect for Valentine's Day! A heart-shaped, crispy meringue, swirled with raspberry jam, dipped in melted chocolate and topped with vanilla whipped cream, fresh berries and berry sauce! 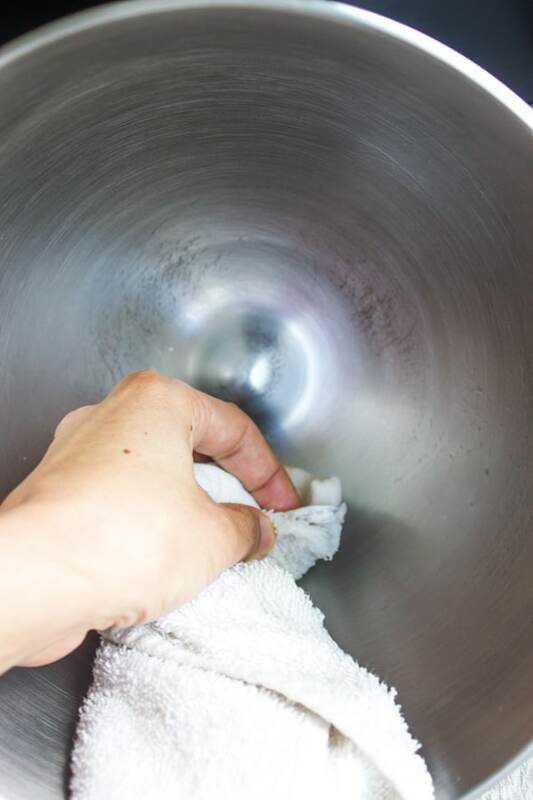 Preheat the oven to 230 degrees F. Take a towel and dip it in vinegar, then swipe the towel on the bowl and beaters you’ll be using to wipe the egg whites. 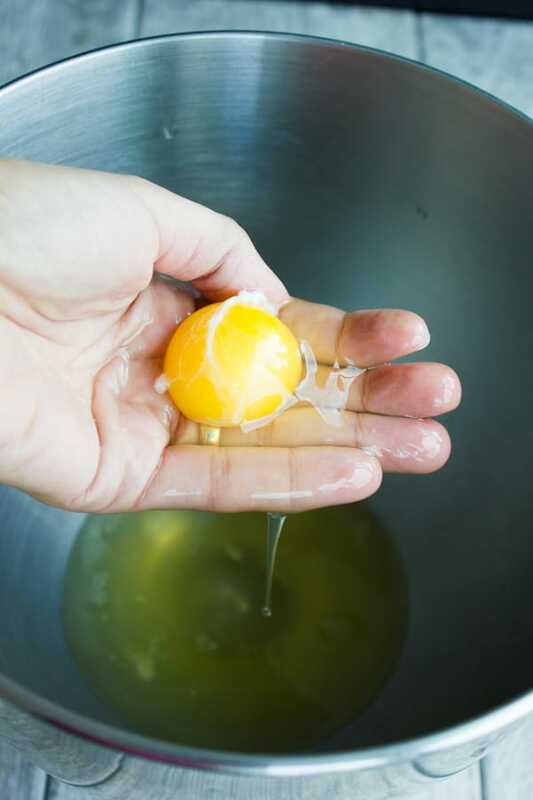 The best way to separate egg whites is ultimately by hand, simply dump the egg in your hand closing your fingers tight. Then gradually lose up and separate your fingers to let the egg whites fall into a clean bowl and flip your hands to hold on to the egg yolk. If you’re not comfortable trying this, go ahead and separate the egg your way. But I promise this hand technique has no risk of egg yolk leaking into your egg whites. Start whipping the egg whites and when it starts to get foamy, that’s when you add in the pinch of salt and sugar gradually while whipping continuously. Take some raspberry jam and use a skewer to streak straight lines, then remove your hands and flip the piping bag back to it’s original form. Fill up the piping bag with the whipped egg whites and pipe hearts on a parchment lined baking sheet. You can swirl some more jam over the top of each heart. Bake these pavlovas for about an hour and 40 mins. Cool down the pavlovas for an hour before handling them. Dip half the pavlovas in the melted chocolate and allow them to cool for an hour. Make raspberry sauce and vanilla whipped cream. I am a huge fan of pavlova! What a great idea to dip them in chocolate!! Love these photos too! I remember the day I saw someone separating eggs with their hands, and I kicked myself for fussing over so many yolks with weird tools and jagged shells. Now I only ever use my hands. It’s SO much easier. So true Lindsey lol! So many people still tell me it’s intimidating to separate egg yolk and white by hand! 🙂 Thanks for your kind words! These look absolutely delicious, so cute as well! Love your gorgeous photos. Thanks Fareeha! I’m so flattered! !